He was the first Transformers robot to befriend a human. With his allies again in danger, Bumblebee drops his disguise and charges into battle! There�s probably not a lot left to be said about Bumblebee. He is a character that disappeared after G1/G2, and then made a mind-blowing return in the Transformers live action films. Having had very few figures for over a decade, Bumblebee has become the cash-cow of the Bay films, and has been the subject of myriad toys. Almost all of these are only a slight variation on the modern Chevy Camaro with near identical robot modes. 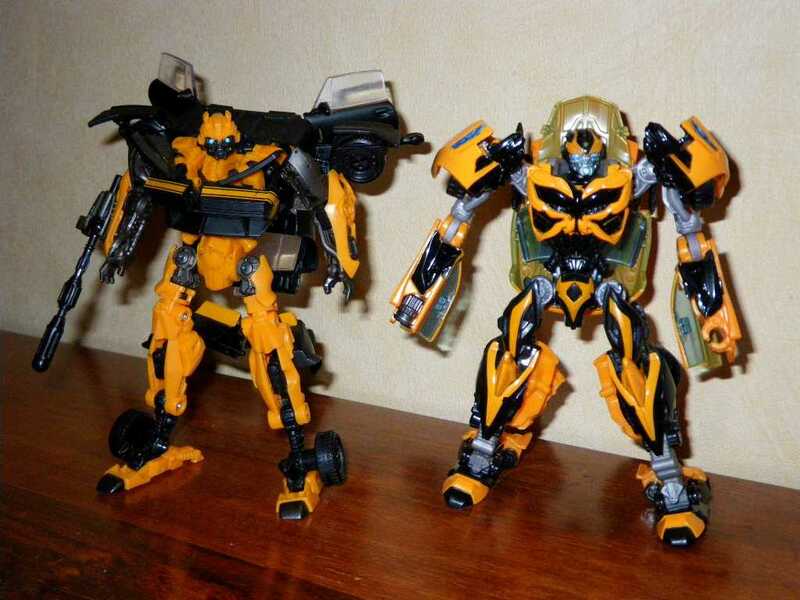 As such, you�re reaction to the new Bumblebee figures for Age of Extinction (AoE) was likely the same as mine: PASS. However, AoE has actually done new things with both the design and presentation of Bumblebee. Firstly, no longer is he the number one Transformer � now he�s an awkward character that takes more of a back seat. Secondly, he appears initially as a black 1967 Camaro, and winds up as � you guessed it! � a yellow 2015 Chevy Camaro. While the 1967 Camaro Bumblebee has a very similar robot mode to the previous films, the 2015 Camaro Bumblebee is a more radical departure, mimicking the far more stylised human-designed Decepticon, Stinger. The latest concept Camaro (2015 SS) is a departure from the more aggressive versions featured in Revenge of the Fallen (ROTF) and Dark of the Moon (DOTM), and returns to the sleek design feel of the first film. That said, a series of vents and angled slit headlights do give it an edge the original. The brochures claim it�s a sports car, and the design has certainly moved more in that direction but it still has some of the feel of a muscle car. That said, there are a lot of optional modifications you can choose on the 2015 Camaro to give it a relatively distinct look (e.g. vents up the middle of the bonnet, none, more aggressive frontend�). Measuring 5� (12.5cm) long, Bumblebee is the same length as (although much bulkier than) Deluxe Lockdown�s Lamborghini mode, although comes in at 1/38 scale (whereas Lockdown is 1/37.6 � so close�). It�s a bit smaller than the DOTM figures, and notably smaller than ROTF toys. After spending the beginning of the film in black, Bumblebee returns to his iconic yellow with his updated alternate mode, and the black racing stripes also make a return, although this time just a single big one running down the centre of the car (like DOTM, but unlike TFTM and ROTF). The yellow plastic is a deep glossy colour matching the original movie�s deluxe figure, giving a much nicer finish than DOTM Bumblebees. That said, the Hasbro version looks to have cheaper plastics, so this is a benefit of the Takara release. Black paint picks out frontend details, and metallic blue paint highlights the headlights to nice effect. Sadly other features have not been painted, despite a very high level of moulded detail. The windows and clear blue plastic (nice) and wheels are plain black plastic. The star weapons that seem to replace Bumblebee�s wheels in robot mode are stored underneath the car, and don�t interfere with rolling at all. On the downside, the top point of one protrudes ever-so-slightly from the rear of the car. Had the stars been orientated the opposite way round, no points would protrude, so this seems like a thoughtless design error � although is minor. Overall this is a very nice alternate mode, and moves further from previous Bumblebee concept Camaro designs � perhaps enough to warrant a spot in a collection even if you�re not Bumblebee mad. Bumblebee�s transformation is a rare thing for a car Transformer these days � unique. Following the current trend (to focus on the target audience � ie kids � again), the transformation is relatively simple when compared to some previous movie figures. However, complicated is not necessarily best! I�m a big fan of well-thought-out efficient transformations that are also fun: Bumblebee definitely fits this description. And it�s very different from what has become the (very) well-worn movie Bumblebee standard model. Which I suppose was necessary given the fairly radical robot mode redesign, retaining the more-or-less standard Camaro car mode. The legs in particular are very well done, and great fun! The level of detailing is amazing, and compared with the paint-deprived Hasbro release, the Takara version picks out much more of this in black and yellow paint as appropriate. Grey plastic also adds another colour in this mode. Bumblebee�s new robot mode is the biggest departure we�ve had in his design since he updated to the 2008 concept Camaro way-back-when. Of course, he�s based himself off of the human-built Transformer, Stinger, and is much sleeker than before. This also comes with greater deformed sections of car though, and so a false chest is required to replace the central section of the Camaro�s frontend. On the plus side, the real frontend folds neatly away under the false chest, so there�s no duplicate kibble on show. 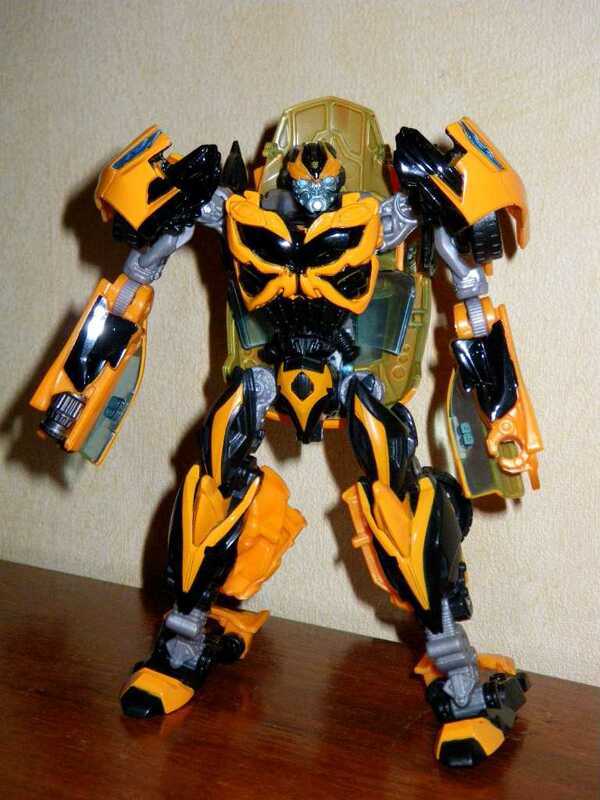 Bumblebee�s robot mode design also lacks the previous car door and wheel wings, and parts of the front of the car fold over his shoulders (reminiscent of Alternators Mirage). The head sculpt is super-detailed, with the face picked out in silver paint (with pale blue eyes), and helmet in black and yellow. The smallest ever Autobot insignia is stamped in the centre of the forehead. Also, unlike stock photos, the car roof folds back nicely, as does the rear of the car, and the stars can be stored on his back. Downsides to the design? Well, the most obvious one is the large part of the car bonnet which towers behind Bumblebee�s head. It�s cast in transparent blue plastic, with yellow paint on the other side, so it�s not as obtrusive as it would be where it cast in yellow, but it�s still there. I don�t think it would have been difficult to have this fold back down out of the way. Also the throwing star things � firstly, there are only two, not four. Secondly they can�t be positioned like wings, and it would have been easy to have moveable mounts on the backpack. Still, he�s a far-cry better than the first Deluxe attempt at TFTM concept Camaro (which I thought was amazing at the time! ), and it is possible these flaws will be tweaked in future movie toy releases with the sequels down the line (if his design doesn�t keep changing radically between films). Articulation is great (19 meaningful points, but sadly lacking a waist swivel for no apparent reason�), allowing a lot of cool poses, and he has a great centre of gravity. The real winning features though are the arm cannon and the battlemask. Despite being much smaller than Battle Blades Bumblebee, he has both a fold down battlemask (although this is a little fiddly) and a flip out arm cannon (that is completely hidden when stored away). Just beware though � the battlemask has a habit of popping off and is very very tiny! I was really surprised by this figure � he�s one of the most fun movie Transformers I�ve bought, yet he�s the umpteenth Bumblebee. I did not expect that at all. I think the mould is great, and I would recommend picking him up even if you�re not obsessed with Bumblebee. The Takara version does have a much better paint job though � the Hasbro one is bland by comparison and does not do the mould justice. Of course, addressing the elephant in the room: the design was clearly intended to allow reshelling as Stinger. Sadly, this did not happen although the good news is a red version is being released as Stinger by Takara next year. It doesn�t have a new shell � ie Stinger turns into a red Camaro instead of a Pagani Huayra. If you don�t want another Bumblebee though, perhaps Stinger is the version of the mould for you! 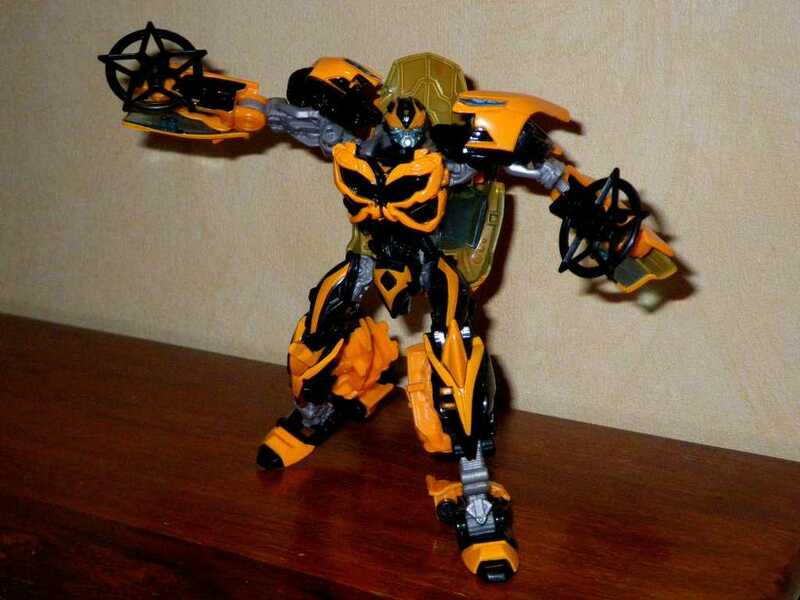 Transformation Design: 8 � Bumblebee�s transformation is innovative, fun and quite simple. With a few tweaks of the backpack kibble and star wing mounts it could have been sheer perfection. Durability: 7 � Overall the plastics used are solid, with the exception of the stars which feel brittle and flimsy. Unfortunately the battlemask has a habit of popping off and could be very easily lost forever. Fun: 9 � Bumblebee is amazingly good fun, and the flip out cannon and battlemask are great features especially on such a small figure. Sort those star wing mounts out and he�d be a solid �10�. Aesthetics: 9 � Bumblebee looks gorgeous in both modes, and Takara�s finish really brings the quality of the mould to the fore, especially compared with the bland Hasbro version. A little more paint on the car mode (e.g. rear lights), an additional fold for the backpack kibble and adjustable mounts for the star wings and he could score �10�. Articulation: 9 � 19 points of articulation! I�d say that�s pretty awesome! However, he does lack a waist joint for no good reason, and it�s a bit weird that many of the joints are ratcheted on such a small figure (at least not so stiffly as High Octane Bumblebee�). 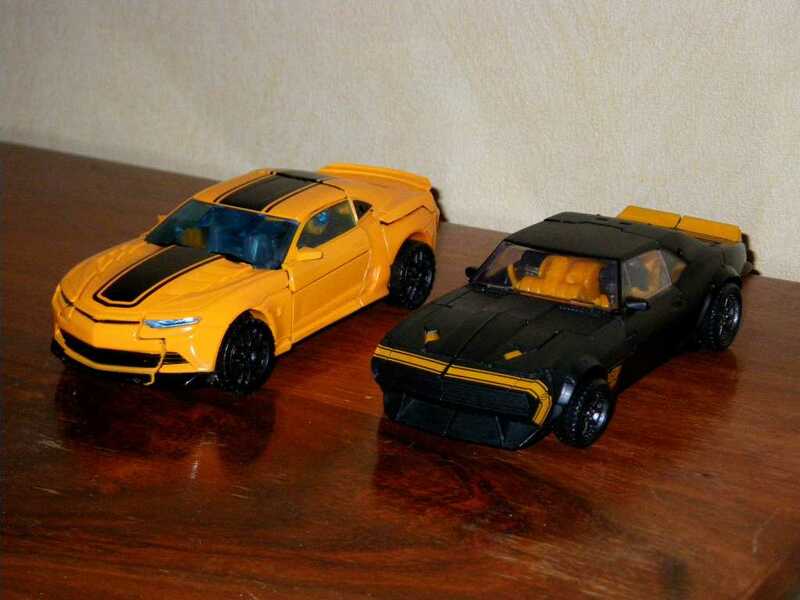 Value/Price: 5 � 2015 Camaro Bumblebee is definitely the best Deluxe mould to have come out of the AoE line (I have them all now so am in a position to compare!). The Hasbro price point has risen, and their release lacks paint and quality plastic, while importing the Takara version is expensive. However, if you have to import then go for the Takara version. If you bulk import like I did, it actually only costs shelf price anyway (�15 GBP or less). This is a great mould, and the best you�ll get from the AoE line, but I�d still struggle to say this is good value for money. 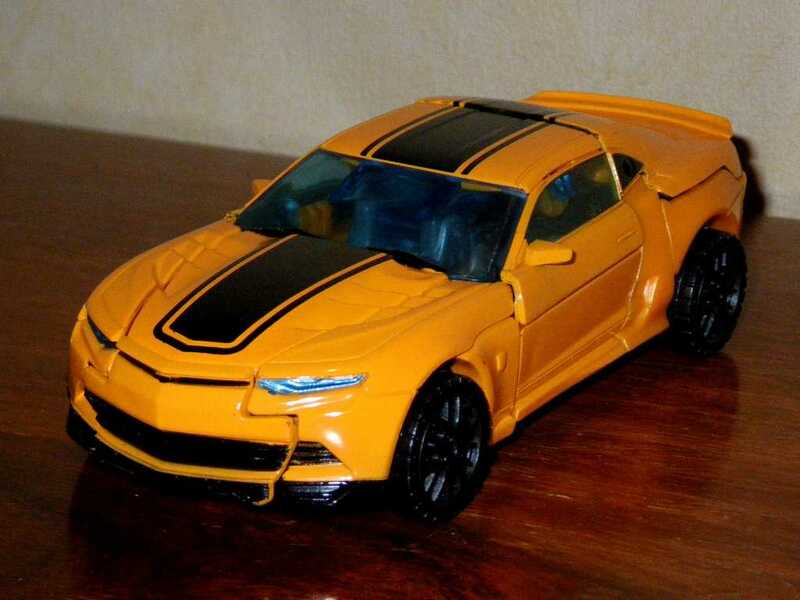 Overall: 9 � The 2015 Camaro Bumblebee is the best Deluxe figure to come out of the AoE line. What�s more, despite being the umpteenth movie Bumblebee, the design has taken such a significant departure that he�s all new even sharing a similar alternate mode with his predecessors. I imagine many are reluctant to buy yet another Bumblebee, but I would urge fans of movie figures to reconsider on this occasion. If you can�t bring yourself to buy Bumblebee, perhaps the upcoming red Stinger version is for you (after all, that would also add a much needed third villain to the mix currently dominated by many many AoE Autobots and Dinobots�).